“The internet is slightly different. And it’s evolving. It’s unpredictable, messy, organic, empowering, addictive and pervasive. It’s good and bad—highly interactive, responsive, connective and alive. In fact, it’s a lot like life. And like life, with it everything is risky. Each time we step outside our homes, we put ourselves at risk. The world can take us out at any time. A car accident, a virus, an act of nature. 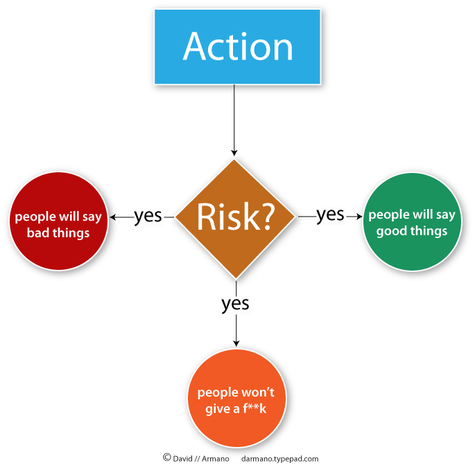 So how to avoid a risk? There’s no magic tool. It’s like in a bar, when you want to outreach someone. You definitely have to know what he likes, what are his / her fears. What are his / her cultural barriers too! And for that, you have to listen first. For example, in the French blogosphere, this “bad buzz” is not fully understood, because our culture is different, so as this kind of video could be less “aggressive” for us. Probably true, and probably more demanding for marketers: for the first time in the history, if the word-of-mouth is bad, you’ll know it quiet soon online. “With regard to the recent Motrin advertisement, we have heard you.